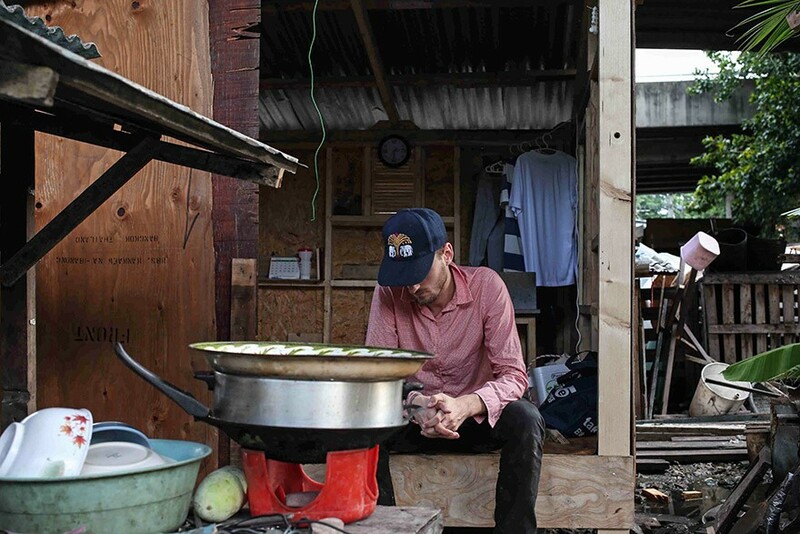 Slum Vacation takes viewers on an up close and personal trip to the Klong Toey slums with a performance project by an American artist, in which he builds a house to live in Thailand’s largest marginal settlement area (slum) for 30 days. He integrates himself into the local community, bringing awareness to the 1⁄3 of the world’s urban population living in slums. Klong Toey, with an estimated population of 120,000 inhabitants one of the largest slums in Asia, is located in central Bangkok. This district also houses the Bangkok University Art Gallery, one of South East Asia’s most important non-commercial art spaces, in which Slum Vacation was first displayed alongside a sound and video installation. Since this projects’ realization, the house has been donated to residents of the Klong Toey Slum. 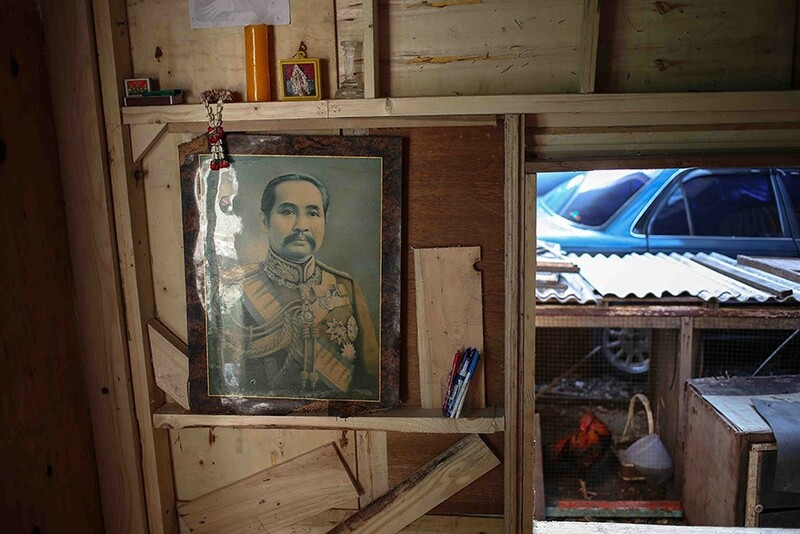 It now houses a small family from Northern Thailand. Slum Vacation has also been shown in different capacities at Sacramento State University, on a 25-story-tall digital billboard at Times Square, New York (US), at the Greek Film Archive / Film Museum, Athens (GR), Museum of Almería, Almería (ES), and in Bronx Art Space, New York (US). 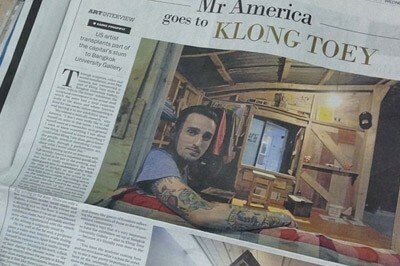 The main aspect of this work is the performative character of a white American male in his early 30s, the most typical age of the inhabitants of Klong Toey, moving to one of the poorest areas of Asia. The project is loosely inspired by Taiwanese artist Tehching Hsieh, where Phil took himself out of his safe, comfortable life and became part of the neighborhood. Through his interactions with the locals, he sheds light on the truths of life in the slums by the harsh realities the locals face through crime, drug abuse, and disease. The house, roughly 3.2m by 2.2m, is made by traditional building methods by local carpenters who work on the active train tracks, using earth, wood, tarp, and residual products all found in Klong Toey. 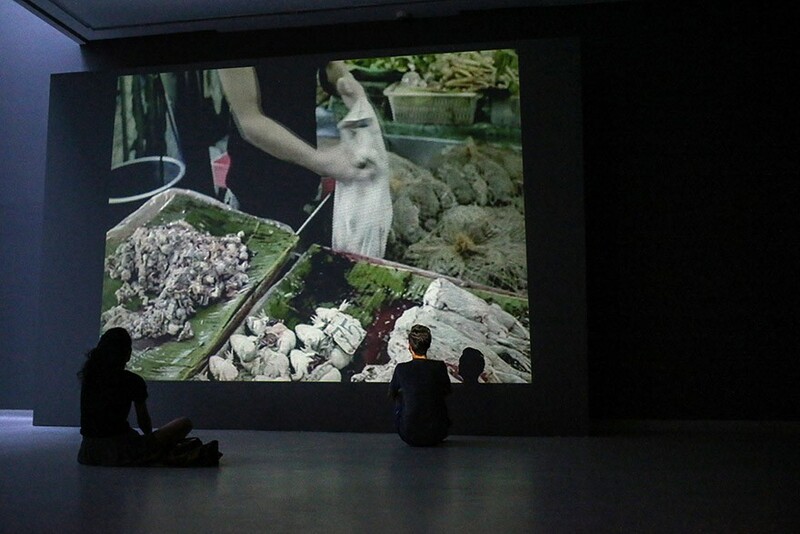 The house in which Phil lived was first exhibited at the Bangkok University Art Gallery, together with a six-channel surround sound multi-channel installation, traditionally used in cinemas, played sound recorded in and around the house and gave a 360-degree experience bringing the viewer to a place outside of the university and into the heart of the slums. The ability to see, hear and touch a night in the slums, brought an experience many will never have either the opportunity or the courage to experience on their own. The light was dimmed to re-enact a mid-summer’s evening. There is a video of the entire process, mixed with the school and it’s surrounding area, projected as a 3x4m large wall to wall installation. 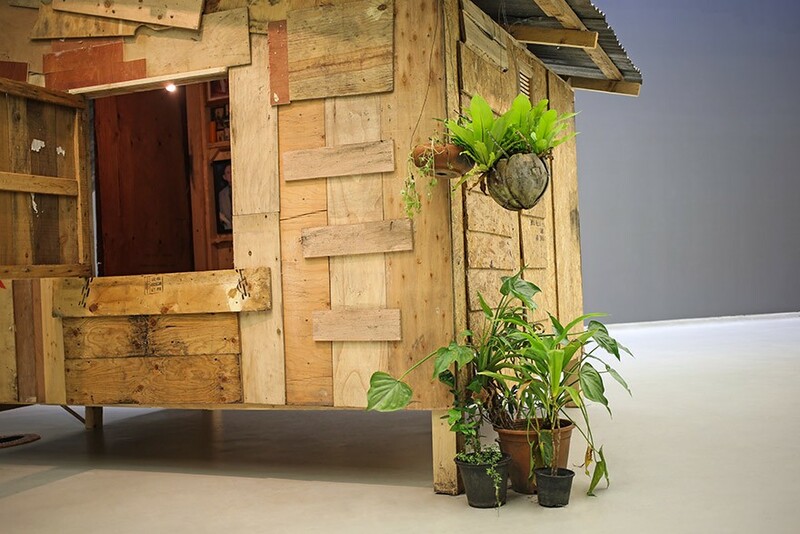 While slum houses have been shown within an art context, through artists like Tadashi Kawamata, they have never had the intensity and authenticity coming with the performative character. Rather than simply re-enacting a scenario that other artists have only experienced through videos, books and other media, Phil America’s work is a part of his life that gives a personal piece of himself captured in a moment in time and shown to the public. 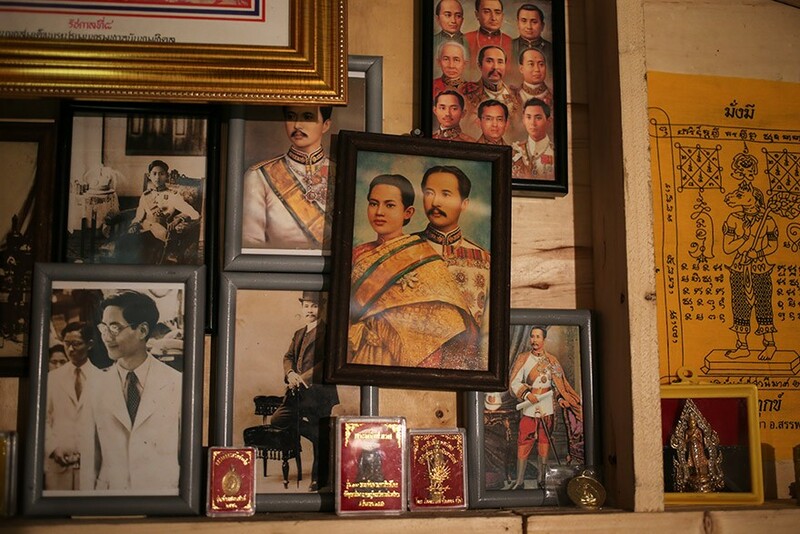 The neighborhood, made up primarily of rural migrants from Northeastern Thailand, is divided in numerous sections, all of which are vastly different than the other. There is block buildings typically associated with the slums of both North and South America, a railway line that cuts through the slum lined with homes nearly touching the passing trains, single-level homes built on small sois near the port and even shops and houses made under the passing highway. 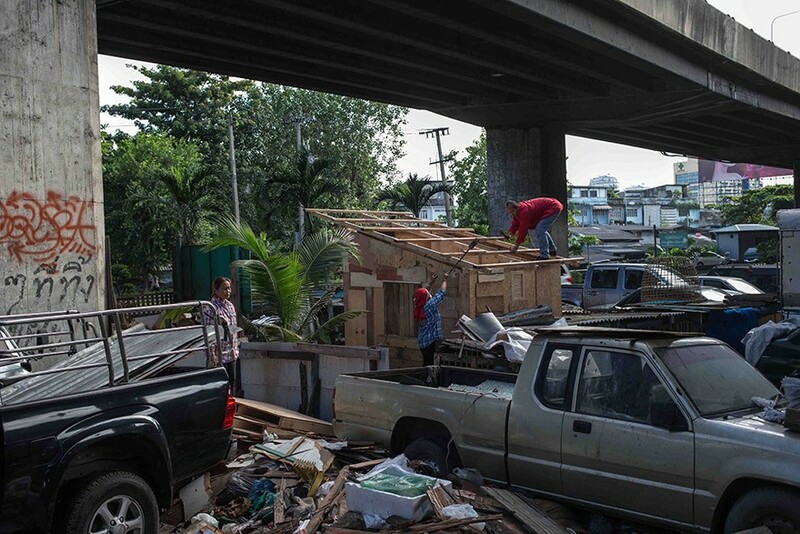 The section under the highway parallels the train tracks and is considered to be the most dangerous area of the neighborhood due to the rampant use of Yaba, a drug concocted of methamphetamine and caffeine, and the strong control of the local Thai mafia. While the majority of the neighborhood is unable to receive any basic facilities such as a running water supply, waste removal or electricity from the local government, they have a manager to create a society outside the norm of shopping malls and sky-rises typically associated with the country’s capital. The Mercy Centre, based out of Klong Toey slums, stands together with the poor to work to help the children and communities of the many slums of Bangkok. Together with their neighbors they create simple-but-progressive solutions that touch the lives of thousands of the poor every day. They build and operate schools, improve family health and welfare, protect street children’s rights, combat the AIDS crisis, respond to daily emergencies, and offer shelter to orphans, to street children, and to children and adults with AIDS. 5 Responses to "Slum Vacation in Bangkok, Thailand"